Weight training is only one small part of developing an overall great physique. In fact, there is a lot to be said about the benefits of bodyweight training, which is a method of working out that requires only the use of your own weight as resistance. If done properly this type of workout can be done just about anywhere, including your yard, home, or hotel room. What some guys don’t realize is that their own body weight has the potential to provide enough resistance to create mass, definition, and strength. In addition, it can be a great way to avoid the injuries of using excessive weights. To give you an example of how effective these routines can be, Human Kinetics has provided us with an excerpt from their book, Bodyweight Strength Training Anatomy, written by Bret Contreras. This is hands down one of the most comprehensive books we’ve read about using your body to create strength and fitness, and we highly recommend giving it a read. There’s a reason Mondays have been coined International Bench Press Day. Lifters around the world who desire well-developed pectorals prioritize their workouts by training their chests first each week. While most male exercisers are consumed with building the upper, middle, and lower areas of the pecs to their potential, women tend to be less concerned with chest development. 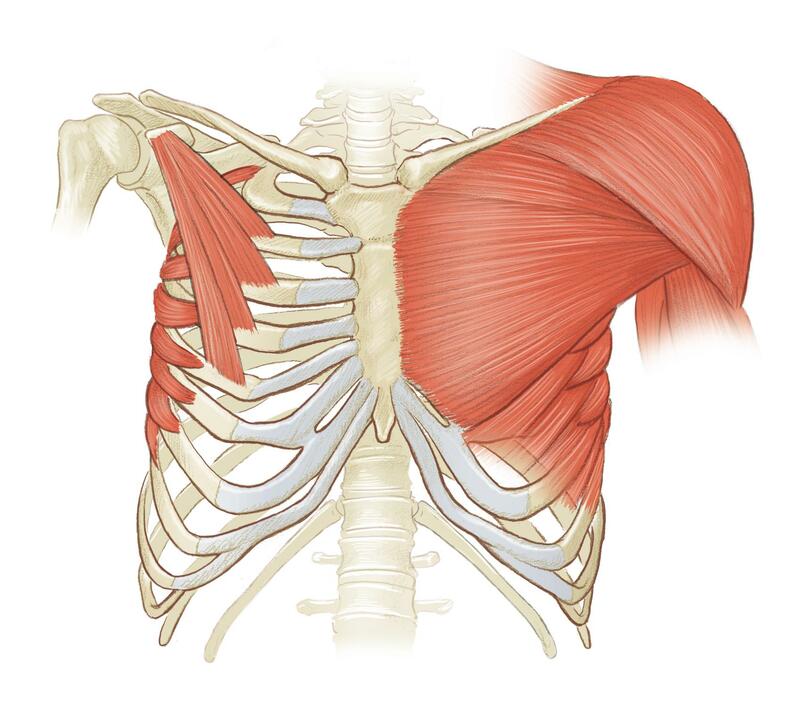 However, a subtle line of muscle traversing the sternum can be quite attractive on a woman, and given that multijoint chest exercises also can serve as great triceps builders, it makes sense for women to incorporate pectoral movements into their routines. Bodyweight training is well suited for chest training; all you need is a floor and you’re good to go. It’s essential that you pay attention to feeling the pectoral muscles working during multijoint pressing movements. Otherwise, the triceps and front deltoids can take over and rob the pecs of their neural activity. Bodybuilders refer to this as developing a mind–muscle connection, and it’s one of the most important techniques you can use to enhance muscle development. While the push-up, referred to as a press-up in some countries, is arguably the most popular bodyweight exercise and certainly the most common bodyweight chest exercise, it’s important to progress to more challenging variations of the exercise for continued results. There are dozens of types of push-ups, and I have included the most effective push-up variations to allow you to achieve your goals. Moreover, it’s critical that you learn the proper way to perform a push-up from the get-go because a vast majority of exercisers perform this movement incorrectly. I distinctly remember when I started performing push-ups. I was 15 years old and could barely manage three sets of six repetitions. I’m pretty sure my form wasn’t up to par back then either. Fortunately, I stuck with it and didn’t give up. Fast forward to today, I’m now able to perform 60 nonstop push-ups. A nice fringe benefit of push-up performance is the core stability that comes along with it. The pectorals also are involved in many sport actions. Pushing opponents forward as in American football or sumo wrestling relies heavily on the pecs. Straight punching as in a jab or right cross involves the pecs, as does arced punching such as hooks or uppercuts. Tennis, volleyball, racquetball, and handball actions involving overhead and swinging motions across the body such as serving, forehand strokes, and spiking, involve the pectorals, as do throwing motions in baseball and American football. A shot-putter and discus thrower require strong and powerful pectorals to heave their implements the maximum distance. Mixed martial arts relies on the pecs for striking, clinching, takedowns, and grappling. Gymnasts and swimmers require strong pectorals for various maneuvers and strokes. Even track and field athletes train the pecs because a strong upper body can increase speed. Some strength coaches prefer various types of push-up exercises to barbell bench pressing because they feel it’s a safer and more natural movement pattern. Many feel that the requirements of the scapular stabilizers during the movement creates strong and healthy shoulders and safeguards against injury. The push-up is also a military training staple. Gymnasts are often able to perform a bench press with twice their body weight despite the fact that they never bench press; their extremely strong upper bodies are developed through frequent push-up and dip exercises and gruelling event practice. 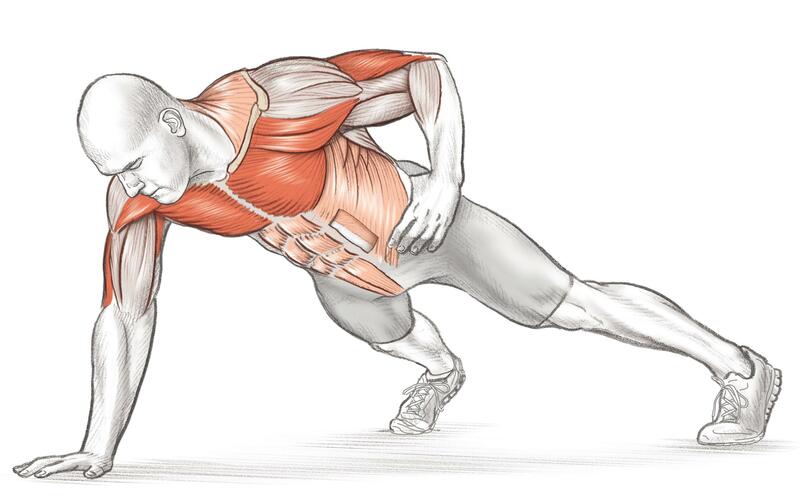 For optimal sport performance training, explosive pressing exercises are easy to perform through push-up movements that lend themselves to clapping and plyometric (repeated explosive movements) variations. The feet-elevated push-up is an advanced pectoral exercise that uses a greater percentage of body weight and changes the angle to make the movement more like an incline press, thereby activating more upper-pectoral musculature. Although you need to go deep for maximal effectiveness, try not to look up too much at the bottom of the movement so you don’t hyperextend the neck. 1. Take a wider-than-normal stance. Place one arm under your body and grab your upper outer leg with the nonworking arm. 3. Lift yourself to lockout while preventing excessive lateral and twisting motions. 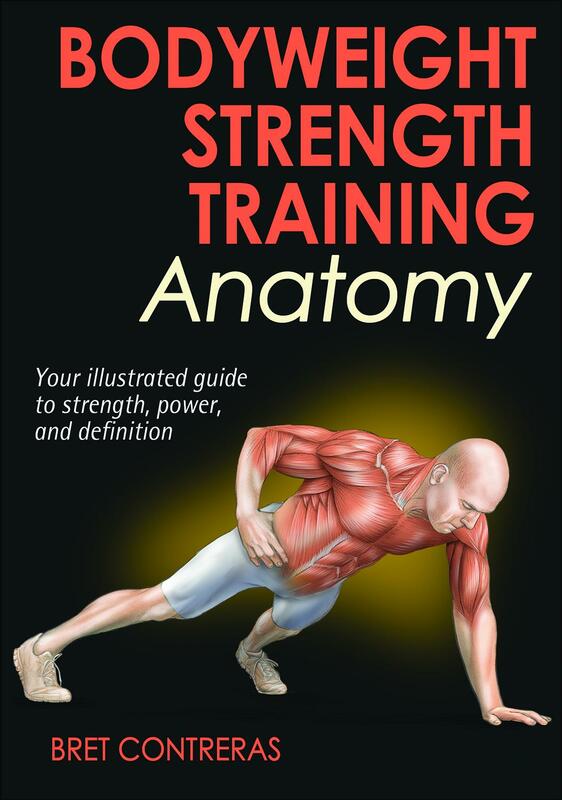 The one-arm push-up is the most challenging push-up variation included in this book. It is very difficult. Build up to performing this movement by starting with a short-lever position from the knees or from a torso-elevated position with the hand on a sturdy table or chair. Also you can simply lower your body by performing controlled negatives (lower yourself slowly) until you’re able to push yourself back up properly. Control the side-to-side and rotary motions with strong core contractions. You can perform self-assisted one-arm push-ups by placing one hand on top of a sturdy chair, weight bench, or stair and relying on the other arm, hand on the ground, as much as possible to execute the push-up. The hand on the chair or bench provides the minimum amount of resistance to help you achieve the repetition. This is an effective movement and serves as a valuable intermediate exercise between two-arm push-ups and one-arm push-ups. 1. 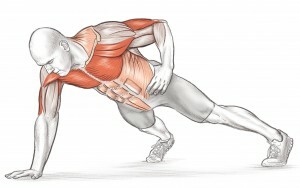 Begin in standard push-up position with both hands on paper plates, flared out slightly. Instead of paper plates, you also could use commercially available sliding exercise discs or, on a slick floor, small hand towels. 2. Lower the body while sliding the arms out away from the body until the chest touches the floor. 3. Push the body up to starting position. The sliding fly is an excellent way to target the pectorals. This movement is advanced and you may have to focus on controlled negatives, which involve lowering the body slowly, before you can perform them properly. In this case, you could perform a controlled negative from your feet and then drop to your knees and perform the concentric (positive) portion until you are able to do the exercise from the feet for the entire repetition. Make sure you’re stretching the pecs and keeping the body in a straight line. Ensure that this movement is a fluid gliding motion and not choppy. Bodyweight Strength Training Anatomy is written by Bret Contreras, who trains figure competitors, writes programs for clients from all over the world, and consults for various professional sport teams. Bodyweight Strength Training Anatomy is now available in bookstores everywhere, Amazon, and www.HumanKinetics.com.